Law enforcement officers live anything but an ordinary existence. They're our community members and guardians. Our neighbors and night watchmen. Our friends and our first responders. And they don't always get the credit they deserve. In recognition of those special, often under-appreciated men and women, Axon teamed up with chart-topping band One Republic to create a tribute video with One Republic's song “I Lived” serving as the soundtrack. One Republic gave the tribute performance during Axon's 25th anniversary party at IACP 2018. 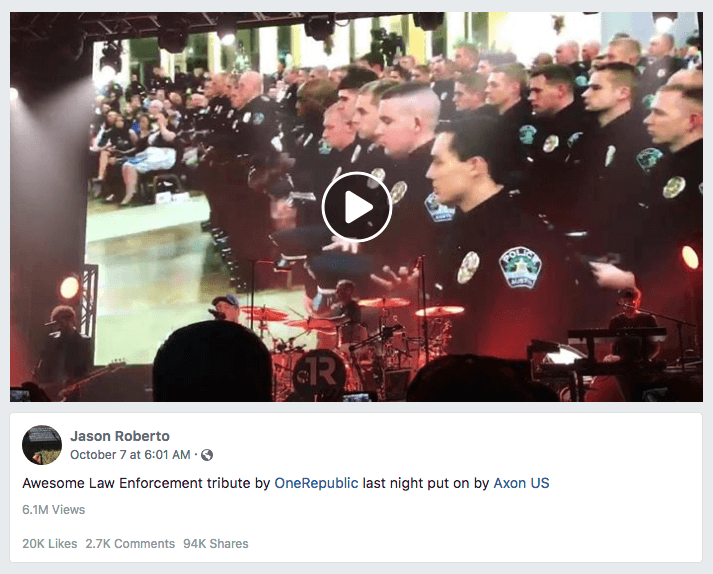 Lake County, IL Police Chief Jason Roberto was in attendance and recorded the performance and shared it to his Facebook page. The result has been an outstanding outpouring of support and appreciation for those in blue. As of this writing, the video has been viewed over 6 million times and has been shared over 90,000 times. From everyone here in the Axon family, thank you to all those in blue. Click or tap here to see the viral Facebook post. No Facebook account? No problem. Click or tap here to see a video of the performance on YouTube.